Quality improvement (QI) methodologies allow healthcare systems to improve the quality of care delivered to patients. Teaching trainees about these concepts and tools is now a required component of residency training. 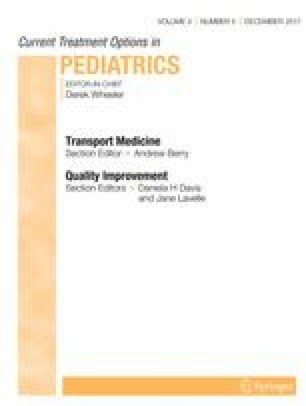 QI training in pediatric residency programs is generally well-accepted and feasible, and many programs include a project component that can effect change in clinical processes; however, there is lack of agreement on best practice standards for training residents in terms of content, format, and assessment. For example, though pediatric residents are generally satisfied with their QI training, one survey found that many did not use basic QI tools during their project design, implementation, and analysis. The majority of pediatric program directors note that a QI curriculum exists in their program but the formats vary; as opposed to residents, only 23% are satisfied with their current program. Additionally, some programs do not use a formal evaluation process to study and improve their curriculum. Innovations in teaching QI, such as focused residency tracks and faculty-resident co-learning, are exciting, but the priority must be creation of a standardized set of learning objectives for trainees. Barriers to successful QI training include lack of faculty expertise and cultural factors, such as misaligned values between the institution, GME, and/or residents. An emphasis on the scholarly output possible from QI projects may help assuage doubts for those who initially do not see the value of QI-based improvements. Kristina Toncray declares that she has no conflict of interest. Accreditation Council for Graduate Medical Education milestones: http://www.acgme.org/Portals/0/PDFs/Milestones/PediatricsMilestones.pdf. American Board of Pediatrics: https://www.abp.org/content/maintenance-certification-moc. Clinical Learning Environment Review: http://www.acgme.org/What-We-Do/Initiatives/Clinical-Learning-Environment-Review-CLER.